As most of you probably already know, here along the Equator seasons are very different. We do not have fall, winter, or spring, only rainy season and dry season. (The rainy season has just begun again.) So obviously "spring break" doesn't make much sense in Uganda. Although we are in Uganda, we are still following an American school schedule, and we have just completed our third quarter of school. It has been a fun and very different school year than any other year we have taught. We are really enjoying our K-11th grade school for missionary kids. 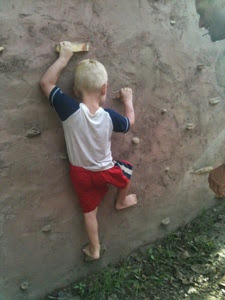 It is always an adventure to teach on many different levels, but it is a lot of fun too. The students learn a lot from one another and they are a really amazing group of kids. Since we completed our 3rd quarter of school and since the Gwartney family was going on a trip with family, we decided it would be a good time for our "spring break." We adopted the 5 weekdays of the Gwartney family trip as our school "spring break." I have explained that it is not actually "spring," but it also has not been much of a "break." We have taken the time off of school other than a bit of grading and reading, but our activities, while fun, have been a pretty exhausting. In my previous blogpost I wrote about the full day on Sunday and the long night that followed. On Saturday, the previous day, we drove to Kampala to take our children to see a movie, Mr. Peabody and Sherman. The movie was enjoyable and funny. We were also able to buy some supplies that are only available in Kampala, but any day that you have to drive to and from and through Kampala is a stressful day, not to mention the stress of shopping. Those who know me well, know that I don't really like to shop unless it is for plants for my garden. As we prepared to go on our trip on Monday, I was already running on a deficit as far as energy and sleep. But even after a night with kids vomiting, we still decided to go. Our plan was to go to a place called "The Hairy Lemon" which is an island in the Nile River. Portions of the Nile flow through and around the island providing creeks and pools and waterfalls. 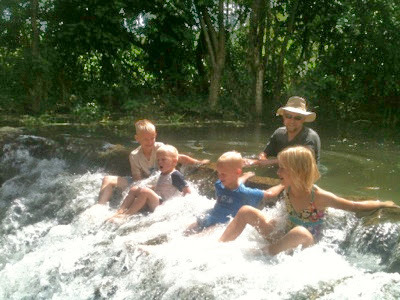 Our kids love exploring outside and playing in water, so we thought they would enjoy this adventure. 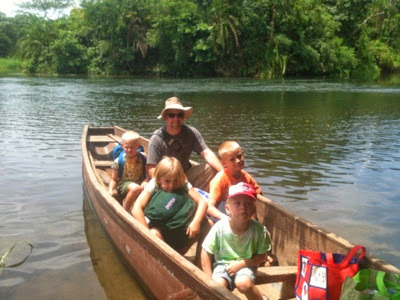 It was a bit of a drive, but when we arrived, they were all very excited to get in the canoe and head over to the island. As soon as we arrived the kids started playing in the water. At first they played in the large open area and then after lunch we played in the little creek near our shelter. As the children and I were in the creek I noticed a long green snake on a shrub overhanging the water. Since I did not know what type of snake it was, I got all my children out, and we moved to another area to play. I needed to take Esther back to our shelter, and when we arrived I found the snake inside. I went to get someone on the staff to take care of the snake, but by the time we returned it was missing. 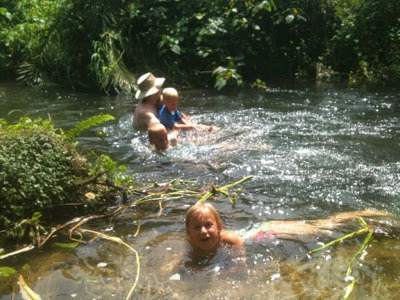 While I was trying to find the snake David and the kids were relaxing in a stream. After finding the snake in the place we were planning to sleep, I struggled to enjoy our time there, but everyone else had a blast. The owner did tell me that what I found was an emerald tree snake and that it is non-venemous which eased my mind a bit. 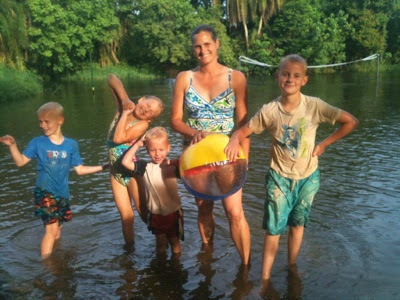 David and the kids played in a waterfall, waded in streams, climbed on a climbing wall, and we all played with a beach ball in the large open area. I figured I could easily see a snake there. We also saw some fascinating wildlife, a tortoise walking and munching on plants, a Nile monitor lizard running ver fast, red-tailed monkeys jumping from tree to tree so far they appeared to be flying, many interesting birds wading and fishing, and of course, the snake slithering and scaring the life out of me. 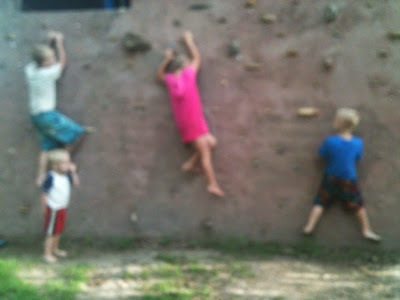 Here are pictures of our monkeys on the climbing wall. Everyone had a fun time, but I was unable to sleep much with high anxiety about snakes. I fell asleep for a bit, but then woke with a nightmare about many snakes. We decided that instead of staying for a second night at "the Lemon," we would just stay and play for the morning, then head back to Jinja for a play date with the Lawsons and maybe find a place to stay. While we were playing at the Lawsons, Jennifer was helping me look for places to stay. It can be expensive and hard to find a room for 6 people in Western type accommodations, so Jennifer invited us to stay with them. The kids were thrilled to have a sleepover with some of their best friends! 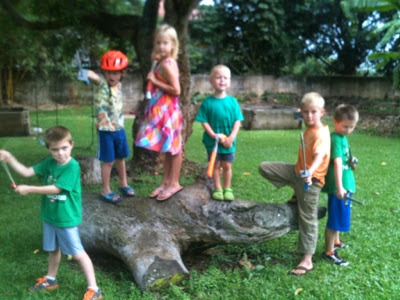 Here is a photo of the kids all playing together in the Lawson's yard. On Wednesday morning we went to a place in Jinja that sells cinnamon rolls for breakfast, ran a few errands and headed home from our adventures. We start back to school tomorrow morning. We definitely had a full and adventurous "Spring Break," although I would appreciate your prayers as I recover from our adventures.